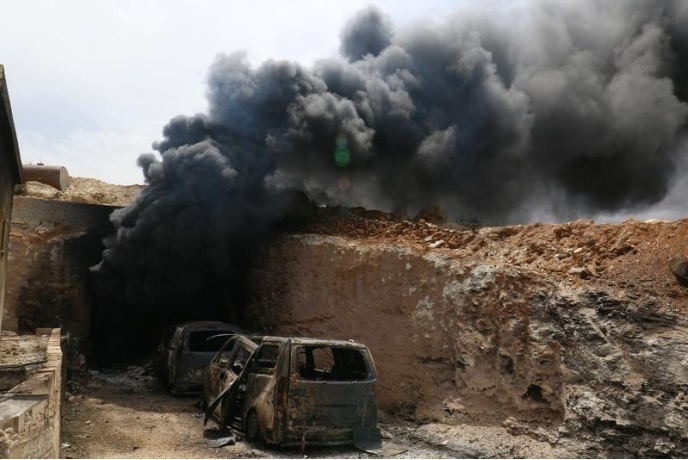 Smoke rises from an emergency service point after an airstrike at the rebel-held village of Maar Zita in Idlib province, Syria April 27, 2017. BEIRUT - The former al Qaeda branch in Syria has pledged to keep fighting government forces and their Russian and Iranian allies, denouncing ceasefire talks in Kazakhstan. Russia, Iran and Turkey agreed on Friday to deploy observers on the edge of a “de-escalation” zone in Syria’s Idlib province, which is largely under the control of Islamist insurgents. While they hailed the agreement as a breakthrough after months of talks in the Kazakh capital Astana, the three nations gave few details. The move falls under a broader deal in which they would set up four such zones across Syria as the war heads into its seventh year. The de-escalation plan has eased fighting in parts of western Syria between rebel factions and government forces loyal to President Bashar al-Assad. The ex-Nusra Front said the Astana process amounted to the surrender of rebel-held pockets, and what had started with a ceasefire would “end with restoring Bashar’s rule to the areas”. The group cut ties with al-Qaeda last year, rebranded, and now spearheads the Tahrir al-Sham jihadist alliance, controlling swathes of the northwestern Idlib province, on the border with Turkey. At least 2 million people live in Idlib, the largest populated area held by rebels - including some nationalist Free Syrian Army factions that have taken part in the Astana talks. Idlib’s population ballooned as thousands of civilians and fighters left areas the Syrian army seized with the help of Russian jets and Iran-backed militias. Tahrir al-Sham criticized FSA rebels that have attended the Astana meetings, which began with Moscow-led diplomatic efforts separate from U.N.-based peace talks in Geneva. “We fear the day will come when those factions will line up alongside Russian warplanes and fight those who reject Assad and his regime,” it said. Bouthaina Shaaban, a senior aide to Assad, said on Friday that attempts to divide Syria had failed, and repeated the government’s vow to take back the entire country including “Idlib and other areas”. Critics have described the de-escalation plan as de facto partitioning of the country after years of multi-sided conflict. Moscow, Tehran, and Ankara deny this and say the zones will be temporary, although they could extend beyond the initial six-month term. The former al Qaeda branch in Syria has pledged to keep fighting government forces and their Russian and Iranian allies, denouncing ceasefire talks in Kazakhstan.